Ladies' winter gloves are a necessity for those living in a northern climate, but you don't need to think only about warmth and protection. Winter gloves can also serve as a fantastic fashion accessory if you shop and match right. There are many winter gloves on the market, from the bold to the utilitarian. When you examine your wardrobe carefully, you'll find that your wardrobe has several areas where you can fill in the blanks. Classic Leather: Your first pair of leather gloves should definitely be a pair of classic leather ones, and you can find them in fun colors as well as the grime-hiding ones. Black and tan are the obvious options, but have you ever considered purple, pink, or green instead? 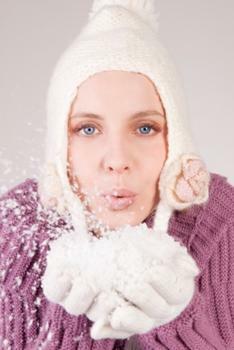 Fur or Faux-Fur Trimmed: Fur-trimmed gloves are cozy and warm, excellent for northern climates. If nothing else, you should pack a pair for emergencies, like car-tire changing and getting stuck in the snow. For those who are opposed to fur, there's also the faux stuff that does the trick. Fleece-Lined: If you're not a fan of fur or you simply don't enjoy the feeling of fur against your skin, there are always fleece-lined items to enjoy instead. Pop on a pair of cozy fleece-lined gloves when you're feeling chilly. You can also find gloves fashioned entirely in fleece instead of simply fleece-lined. Having trouble accessorizing your winter gloves? These tips will get you back on track. Don't forget to pick up a coordinating scarf to blend with your gloves. It doesn't have to be matchy-matchy, of course, but you might want to try combining purple and green or purple and yellow, for example. Look for a basic black scarf or hat to match any pair of ladies gloves you have. If you want a simple matching solution, this is it! A pashmina can be purchased for under $20 and can serve as a wrap as well. Toss that around your shoulders. Get a fleece-lined hat to keep your head as warm as your hands in your fleece-lined gloves. Buy a pair of extra-long winter gloves to wear with bracelet-length sleeves. There's nothing worse than having a small amount of skin peeking out between your gloves and your arms! Fingerless gloves are a practical option for those who are always taking off their gloves to grab something. You can also buy the glove-mitten combinations in wool, which have a small mitten detail that flips up over the fingers. These locations are fantastic places to shop for gloves, but feel free to branch out from here afterwards. For the most accurate fit, check the gloves you own for sizing details, either numerical or S-L general sizing. Revolve Clothing carries youthful glove styles, including ones with a fingerless design perfect for urban living. While you might think that they only carry bright colors, they also have simple colors like grey and black for matching opportunities. Tory Burch is a nice place to buy quality gloves in a thick cable knit design. This casual style will still last for years. GAP carries ribbed fingerless gloves both online and in stores for an attractive price. Try to find a pair available in a vibrant color. Athleta offers sports-friendly gloves in a stylish manner. Look for ones with details like embroidery and subtle ruffles. Modcloth has fun gloves and mittens on their website for $25 and under. Ladies' winter gloves are a nice investment, since they can be practical and stylish. If you're willing to experiment with different designs, then gloves are a smart, fun buy for the average budget. Of course, if you have an unlimited budget, there are gloves out there for you, too.